I am supervising teachers this summer, and so I sat in on an English class the other night where the instructor was going over Venn diagrams. You remember those: two circles that connect with an area in the middle. The middle part is what the two circles have in common, while the outer, separate part of each circle holds what is unique to that circle, and therefore holds each circle's differences from the other circle. Venn diagrams are commonly used to teach the organizational concept of compare and contrast. "So what?" did I hear you say? Well, I just finished two very different books that had me pondering over what they had in common. (You see the connection now?) One book is called The Grass is Singing by Doris Lessing and the other is The Death of Bees by Lisa O'Donnell. If one measure of a good book is that you look forward to returning to it after you've put it down, these are darn good books. 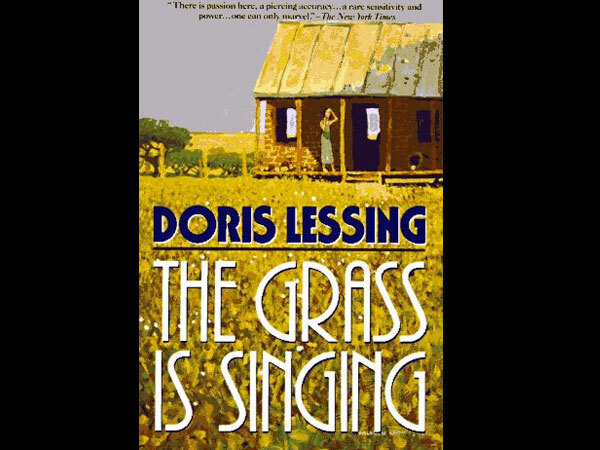 Reading The Grass is Singing is kind of like watching a train wreck about to happen. From the first few pages you know that Mary Turner has been murdered and that Moses the houseboy has confessed to the deed. So there's the wreck. Now you spend the rest of the book watching how and why it happened. Although at times I felt like Lessing could have used an editor to help her with her sentences (I can't believe I am saying that about a Nobel laureate!) and I wondered if her later works improved with the author's experience and maturity, I was mesmerized by this book. Lessing brings the reader inside the psychological breakdown of Mary Turner, an experience so real and painful--yet utterly compelling--that it leaves you both fascinated and exhausted. Warp-speed plot summary: Mary Turner, young, white, and naive, has actually stepped out of the 1940's constrictions on her gender, but doesn't realize that her happiness is unusual. Thus, when she hears her more conventional colleagues gossiping about her not being married, Mary falls prey to society's expectations of her and she marries the first available man that comes along. Unfortunately, that man is a not-very-successful farmer who brings Mary from her urban life to live in a hovel in the bush. He may as well have brought her to Mars, and the changes her new, alien environment wreaks upon her have devastating consequences. I would recommend this book for book groups because there is so much to discuss, especially if you read it through a post-colonial lens (which you know I like to do). The novel caused quite a sensation when it was published, which won't surprise you, so that would be a long conversation all by itself. Just think how we used to look at white versus black. At men versus women. At Europe versus Africa. And then you can discuss whether much as changed. You can talk about how a white British woman wrote this book, and what meaning the book carries due to the author being a white British woman. Who does the author give voice to? What is the author's intention, and who is her intended audience? The theme of identity is pervasive, and one angle through which to view this is the prisons we make for ourselves, the chains we allow to bind us. Physical as well as mental and emotional prisons. Spaces, environments--these all play a large role in the story. One thing that I would love to discuss with someone--so if you read this book, feel free to contact me--is why it is titled as it is. The reference is to a T.S. Eliot poem, but why this line? Why this poem? What does it mean? Another intriguing title is that of Lisa O'Donnell's new novel, The Death of Bees, which came onto my radar because it won the Commonwealth Prize. For more on that prize, click here. This is a quick read, absolutely perfect for this summer. Warp-speed plot summary: Marnie and Nelly's parents are dead. Apparently Marnie or Nelly killed Gene, the father; Izzy, the mother, subsequently hanged herself. Rather than become wards of social services (we are in a very poor area of Glasgow, Scotland), Marnie and Nelly bury their dead parents in the backyard and tell everyone that they've gone to Turkey. No one really cares anyway; Gene and Izzy are drug addicts and appallingly neglectful parents, so anything they do doesn't surprise anyone. Lennie, the gay outcast from next-door, takes pity on the girls and becomes a surrogate parent to them. This seems to be a good solution until the girls' grandfather--Izzy's dad--shows up looking for his daughter. Uh oh. And Izzy and Gene's drug supplier shows up looking for his money. Uh oh. And Lennie's dog keeps digging in the garden. Uh oh. This book is not perfect (but then, what book is? Oh, we could have a long discussion about that). However, I couldn't wait to find out what happens to all the characters in this dark and charming (yes, dark AND charming) story. The voices of Marnie and Nelly are two of the most memorable I've read, and although the situation of the characters is rather grim, you still find yourself laughing out loud. Back to the title: it has almost nothing to do with the book whatsoever. Or...perhaps it has everything to do with it. Suffice to say here--this book is not about bees. So, your book group will be able to spend quite a bit of time interpreting the title. Unlike The Grass is Singing (outside parts of the Venn diagram circles here), The Death of Bees is rather uplifting in its own little way. While both books are dark (you all know by now that I can read dark), Lessing's novel spirals inexorably down into an abyss, while O'Donnell's novel has a much more fairy-tale ending. Truth be told, the ending may annoy some readers, but I enjoyed this book so much, I wouldn't let it bother me. This post is way too long--have you read all the way to here??? Thanks for doing so, and happy reading to you! The Desmond Elliott Prize--We Have a Winner!